Now that the whole starting back to school thing is underway and the consignment sales are ending with me picking up the mound of clothes still left over later today, I have some time to write about how the painting of our new siding and windows went. He came on a day with rain in the afternoon as the forecast. This is typical of summers in Georgia actually, particularly this one, so the painter began only on the siding unlikely to get wet before the paint dried, like the porch and the outcropping under my daughter's window. Before he began, he talked about how he did not know he would be painting yellow on siding with grey primer. I totally get that as that primer color is meant for darker paint colors, but in the end, if the painter did a good job, the primer coat should be covered completely. If he also said that if he had known he was going to have to paint two coats, he would have charged the contractor twice the amount to do the job. Now this is not my problem, as he is a subcontractor and his agreement is with the contractor, not me, however this is my house and so now I become concerned about how well the job will be done if he feels he is not getting paid enough to do it. And so he started. He had plastic down on the porch floor but he did not secure it with tape, so as he spray painted, the plastic was pushed back by the pressure and overspray accumulated on the porch floor boards, which are stained like decking. All that was on the new materials so I was not yet concerned that they had not power washed, but I did think it was out of sequence. Then he moved to the outcropping in the front and mentioned that he did not know he would be painting the foundation also as it was the same color as the house. Even though it was in our contract that the house would be power washed before painting, he did not even wash the dirty foundation area before painting it. Because I was not at all pleased with the quality of work I was seeing, I was thankful that was all he was going to do that day because of the threat of rain, but I also had another issue to consider: The paint color was not even close to the sample. It was supposed to be "Honey Blush" but it was not as warm as the sample. I mean it was significantly off as you can see in the picture. My concern was not so much that I did not like the color that was being put on—in all honesty, it was closer to the color I really wanted not on the samples and I am thanking God for that one—but it was that they had only bought one five gallon bucket instead of the two the job would obviously need and my greatest concern was whether or not color mix of second bucket would be the "Honey Blush" on our house or the sample. Showing the painter the color difference, he said that I was only seeing the unfinished product, being that it was yellow paint on a grey base coat. Well, I was looking at the thick areas he had painted that were dry to touch and with my knowledge of paint I knew it was never going to redden enough to match that sample. 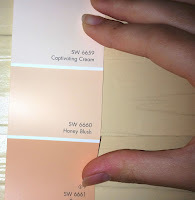 So this was a good excuse to ask him to just stop while I talk to the contractor about the color, but I planned to talk about a whole lot more than that. The painter said he would not know when he could get back to this job as he had another and I was thinking that it might be best if he did not come back at all. Besides that, the trim color was definitely wrong. 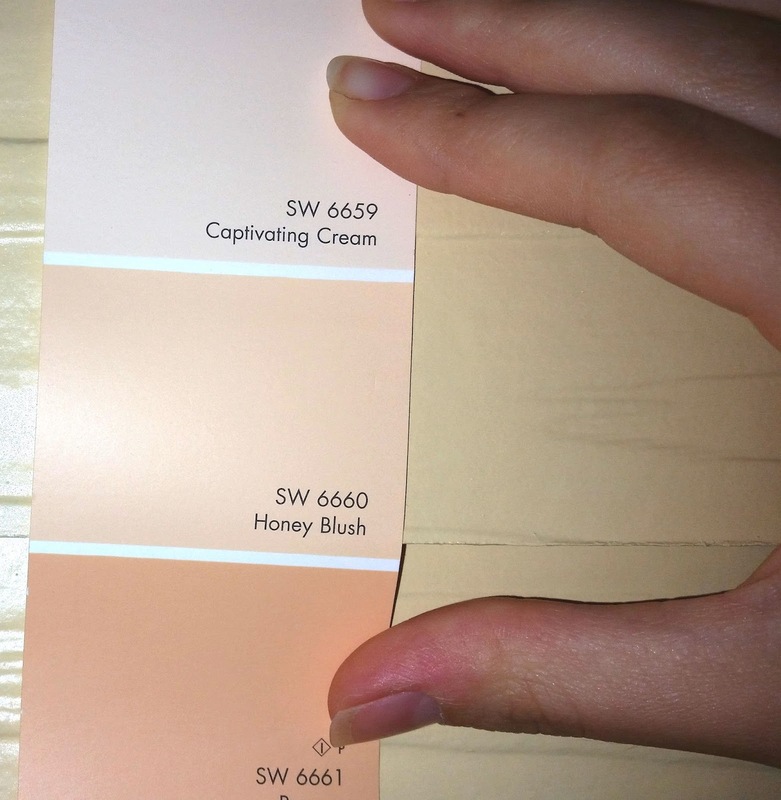 We found out later that the contractor gave the paint company the right number on their order form, but the paint company messed up and their number had one digit wrong on the label, so instead of the lovely cream color I wanted, we had three one-gallon paint cans of a deep rose color—no kidding. My husband came home took one look and immediately wanted to fire the painter. You have to understand that in the meantime my husband had been working several days on the new rails for the porch. This is the second time he has replaced them and this time was all because he had to replace a rotten post with one that was made smaller in width than the one we first had. He was hoping to get the rails done and then maybe hire the painter to paint them. That was definitely not going to happen now, so that was another major job that we were going to have to do ourselves. So my husband painted it with primer and we waited for the job to end to paint it. We did not fire the painter because the contractor gave us assurances that everything would be taken care of and done right as to the painting and the chimney that was not square at the top. After a few days of delay and a few rainy days, another subcontractor came to pressure wash the house. The man also insisted on washing the sidewalks even after I said not to several times, since my husband had done it a few months before. Later we found out that they charged the contractor for washing the sidewalks that they should not have done. They also pressured washed the porch, including the new rail, which now has to be sanded because it torn up the wood in some places. To top that off, they used bleach. Now we have bleach spots on all of the wood on our deck, porch, and even our metal gold door threshold not to mention that my organic herb garden is now completely disseminated. I knew all the gardens next to the house would be trampled and I moved what I could and the rest I knew would have survived that, but not from the bleach. After all that, they did not power wash the foundation under out deck or the chimney, so I took a brush and soapy water to do it myself. Oh, and the new paint on the foundation that had just been applied over the dirt, it all came off just as I knew it would. At that point I just wanted to get it over with so we could begin fixing things ourselves. Every time someone came to fix something, it actually caused more damage. We had a few good days without rain. The siding crew fixed the chimney, not to the point that we loved it, but it was acceptable. Even after all that, he painted, again without protecting anything other than using a hand held spray guard. I have to say the coverage was pretty good at eye level, but what was done on a ladder or where he had to bend, not so much. When he was done, we then had yellow overspray on the back deck, the garage doors which were not to be painted, the brand new windows which were to be painted but still, the brand new back door, the handles of the doors, the decorative rocks in my garden, and even our rain barrels that I had pulled away from the house so they would not be in the way! I just wanted to scream! Really, how much more work does it take to tape and cover a few things like the flooring of the deck and porch or just lay a bit of plastic over a rock! He did not cover anything at all this time. I would have done it myself if he had told me that he was not going to, even after I talked to the contractor about these issues. The trim was not much better. It was hand brushed, but it had no consistency: some of the trim was painted to the inside corner where it met the siding and some to the outside corner. It was laid on thick with lots of misses. With the painting finally done—well, as done as they were going to do it, but I will get to that later—it was time for the new gutters. I have to say that this was the one thing I felt was done well, however my husband did not. We do still have some trouble spots that they could have, should have added rain diverters, but my husband will do it. My Lord, my God, how I desire a perfect world! I am so very thankful that there is a heaven, a perfect place because You are there. Ummm...is this normal? I mean, they're professionals, right?